Onward Manufacturing is one of the largest grill producers in the world with six different brands of grills under their name: Broil King, Broil-Mate, Sterling, Huntington, Grill Pro, and Broil King Keg. Their Broil-Mate line represents the lower-priced brand of gas grills, but this three-burner model is comparable to the company's higher-end Broil King grills. This gas grill is big and powerful but is also basic. It is a gas grill and nothing else—there is no side burner, no smoker attachment, basically, no bells and whistles. It has a stainless steel structure which is solid and durable, but the body parts are lower grade and simply decorative. 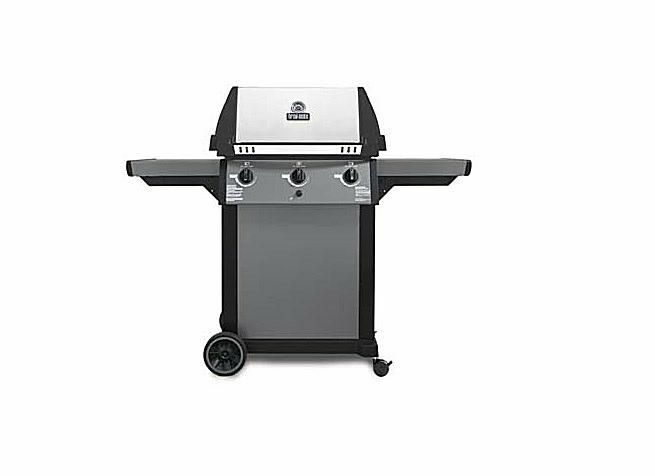 A basic gas grill with solid construction, the Broil-Mate 3-Burner is a great choice in the price range. Two positive aspects of this grill are its even heating and durable construction. The heavy cast iron cooking grates and stainless steel vaporization barrier are built to last and the durable construction and high-quality stainless steel dual burner will make this grill last a long time. At 40,000 BTUs this grill has plenty of power for its 400 square inches of primary cooking area. Add to this the relatively heavy cast iron cooking grates and you have a gas grill that can perform. This grill is constructed from a cast aluminum body with stainless steel panels and powder coated steel frame, but the best part is the cooking chamber. It would be nice if the decorative stainless steel parts were either upgraded to a heavier construction, or the unit was offered at a lower price, but this is a relatively minor issue. For an inexpensive grill, this is a very good choice. Although this grill is constructed well, it is made of low-grade stainless steel and the pedestal that the cooking chamber sits on is a little lightweight. It is an economical option, but, for the money, the Broil King Signet 20—which has some upgraded components—might be the better choice. This grill also has limited distribution, which is unfortunate. It can only be found at various stores in Canada. Here is a quick look at the Broil-Mate 3-Burner gas grill specifications.